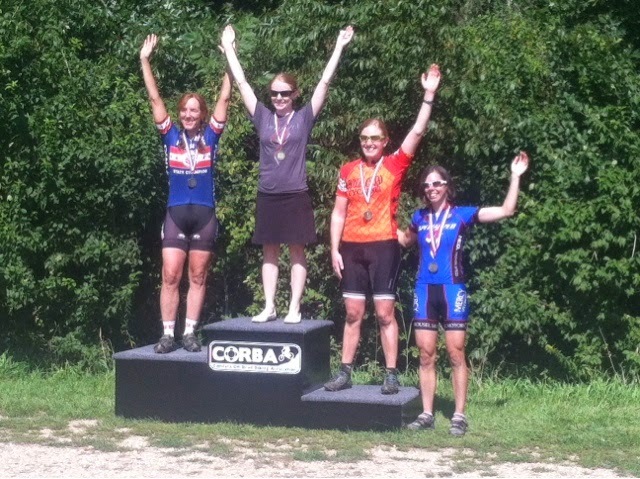 Emily Robnett: Mud Sweat & Gears - Another Win in the Illinois Series! Mud Sweat & Gears - Another Win in the Illinois Series! This race last year was actually my first ever win in the Cat. 1/Expert Category so I was pretty excited to take the win again this year! Bev, Britt, Melinda, and I all had a fast start. I pushed the pace as best as I could and thought I had gotten a small gap until the very end of the first lap. The last trail was very tight and twisty with about 10 or so man made features (like long twisting skinnies and log piles). I only rode a few and the girls caught back up. I crossed through the start/finish with just a 5 second lead. Wanting to get away I absolutely drilled it going into the second lap. I caught back up to a group of the Comp guys that had passed earlier and tried my best to stay with them as long as possible. It’s always so much easier when there is someone in front of you leading the way and setting the pace instead of being out there on your own! I managed to ride a very fast and smooth second lap and managed to get about a minute lead by the time I came back through the start/finish. I continued to go all out on the third lap and I could just see the girls coming into the final section of trail as I was exiting it. I knew I had a decent gap but still didn’t want to take any chances of getting caught. As always I reminded myself to be careful as I sped through the last lap though. No need to jeopardize the lead with a crash! This time when I was finishing up the final section of trail I didn’t see anyone behind. I rode down the long gravel road and came through the finish line with a solid three minute gap. Since the course hadn't changed since last year (except reverse direction) I had the extra motivation of wanting to compare my time this year to my time from last year to. My biggest fear is always that I stop making improvements- I’ve just finished my fourth year of riding and racing so the improvements have come pretty easy up to this point. But I have to motivate myself to work harder each season to keep getting stronger! The Illinois state series is wrapping up and I'm currently in 2nd place with five wins and one DNF. Six races count toward the overall score, plus bonus points for each extra race completed, so the series overall will come down to the final race next weekend! As long as I finish the race I have a good chance to take the series win, so the pressure is on to not DNF! Full Results with lap times - the best part of this series is the timing chip number plates!